Chelsea are understood to have encouraged Crystal Palace to sign Michy Batshuayi on a permanent deal, the Blues have even quoted the Eagles a very surprising fee. According to The Sun, Chelsea are demanding an astonishing £40m from Palace for Batshuayi’s permanent signature, quite the amount considering that the Belgian ace struggled massively for Valencia – where he was on loan for the first part of this season. 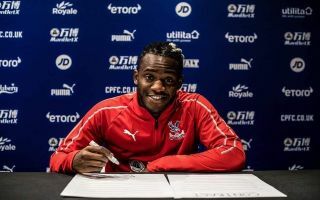 Palace completed a shock deadline day move for ‘batsman’, the 25-year-old will spend the rest of the season on loan at Roy Hodgson’s side.
? Batsman Returns to London! Welcome to the Palace, @mbatshuayi ? #CPFC ? Football fans were shocked to see that Batshuayi would be joining Palace, the enigmatic striker was linked with moves to West Ham, Real Betis and Tottenham. Chelsea weren’t keen on Batshuayi moving to their rivals and according to a report from The Sun, they priced out Tottenham by demanding a whopping £8m loan fee for the hit and miss striker. Palace weren’t priced out for the Belgian, The Guardian reported that Palace will only be paying a £1m fee for Batshuayi. Batshuayi will be hoping to emulate the success that Ruben Loftus-Cheek had with the Eagles. Chelsea haven’t had much success when loaning out strikers to Palace, Patrick Bamford and Loic Remy had a disastrous time with the Eagles. For Chelsea’s sake, Batshuayi will be hoping not to follow in their footsteps.